MetrolineDirect is one of the country's largest independent consultants and independent distributors of high quality technology and telecommunications equipment. We have no affiliation or contractual obligations with major manufacturers, so we're able to locate and purchase quality products at the most competitive prices. In our 60,000 square foot warehouse, we provide complete inventories of both New and Certified Refurbished products and back them with a Rock Solid One-Year Warranty and 90 Day Advance Replacement Service. Many of our products are also eligible for our 2-Year Platinum Protection Plan. In business for over 30 years, we have a proven reputation of superior sales, support, and service that is unsurpassed in our industry. In fact, as a testament to our high quality products and outstanding customer service, we have been awarded with 5-Star Excellence Awards from Shopper Approved and Google Customer Reviews. MetrolineDirect is centrally located in southeastern Michigan in the heart of suburban Detroit. We are a real brick-and-mortar business with real salespeople, customer service representatives, technical support staff, and repair technicians. Unlike some of our competitors, we don't hide behind a website name, PO Box, or email address. That's why we advertise our phone number and address on every single page. We're here to serve you. Call us anytime, with any question, and buy with confidence. Our guarantee to you is top quality product and superior service at the most competitive prices in the industry. We back our products with a complete 1 Year Warranty and 90 Day Advance Replacement Service. What is 'Certified Refurbished' product? Wireless headsets are guaranteed to be like new, completely tested with new ear pads and microphone interface components. We also include new batteries. What is 'Open Box Unused' product? 'Open Box Unused' products are new products that have been opened and never used. During our Standard 1 Year Warranty period, if there are any problems with your product in the first 90 days, then we'll ship you a replacement item along with a prepaid call tag to ship the original product back. The original product must be returned within 14 days to avoid being charged for the value of the replacement item. You must have a valid credit card on file to qualify for this service. This service does not apply to products covered by Manufacturer Warranties. Each manufacturer has procedures in place for servicing their respective warranties. For your convenience, we offer returns on both New and Certified Refurbished products. All return requests must be received within 30 days of the date of invoice. A 15% restocking fee is charged on all New product returns. There is no restocking fee on Certified Refurbished product returns. A 4% processing fee applies to all returns over $500 that were originally paid for by credit card. When a product is returned, the 'FREE Ground Shipping' offer is waived, and the refund includes the total charge amount minus the shipping charge. All Certified Refurbished IP phones are sealed with a red security tape. If the red security tape seal is broken, a 15% processing fee is applied. This fee pertains to settings specific to IP phones that must be defaulted and removed from memory. Returned products must include all original packaging, documentation, and accessories. Incomplete or defective returns will be refused. Software consultation with technical assistance fees are not eligible for refund. For any questions or to request a return authorization, please call 800-929-8061. We will be happy to assist you. Orders can be cancelled prior to the shipment of the product from our warehouse. Once an order has shipped, it cannot be cancelled and a return materials authorization (RMA) must be requested. A 4% processing fee applies to any cancelled order over $500 that has been paid for by credit card. Our in-house repair department employs 12 full-time technicians with over 30 years of experience. We can repair and remanufacture virtually every product we carry and provide flat-rate repair pricing. Items that have no problem found or are not repairable are subject to a diagnostic fee that is equal to 20% of the flat-rate repair fee. For items that are not repairable, the fee is waived if Metroline offers a comparable replacement product that is purchased by the customer. We provide FREE FedEx Ground shipping on any online order over $500. For online orders totaling less than $500, FedEx Ground shipping is only $9.95. The offer is valid in the contiguous United States. The vast majority of our orders are shipped the same day as placed. If there is any significant delay in your order leaving our warehouse, you will be contacted promptly by our customer service department. We offer FedEx Ground, 2 Day Air, Standard Overnight, and Priority Overnight shipping. We offer extensive, expert technical support services. 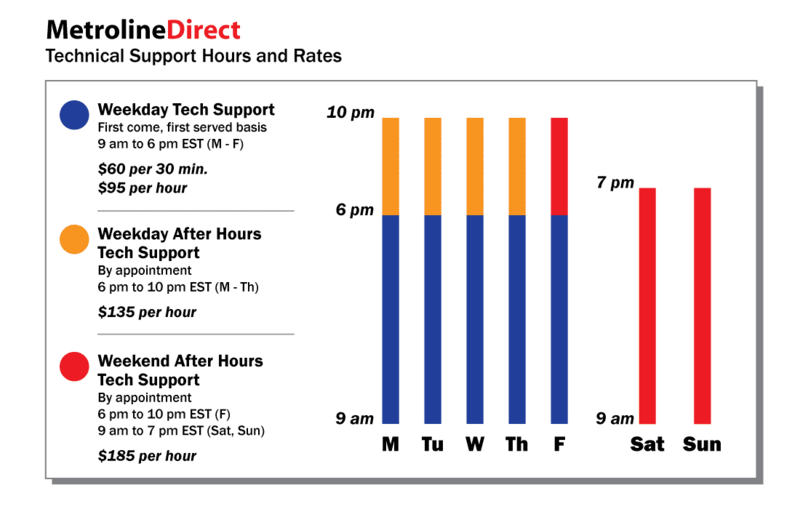 Technical support is provided over the phone or through remote system connections and is charged hourly or per call. Although we do not offer installation services for your equipment, MetrolineDirect administers a searchable database of over 4000 installation professionals at PhoneInstallers.net. What products carry manufacturer warranties? All new Plantronics, Jabra, Konftel, Digium, Cortelco, Sangoma, Aastra, Grandstream, Pro Digital, and Intellitouch products carry one year (or greater) manufacturer's warranties. View our complete warranty information (.pdf) for additional details.